Less than 5 percent consider either “Inflation” (4 percent) or the “International Situation” (2 percent) to be the most serious threat to achieving their household’s financial goals at this time. 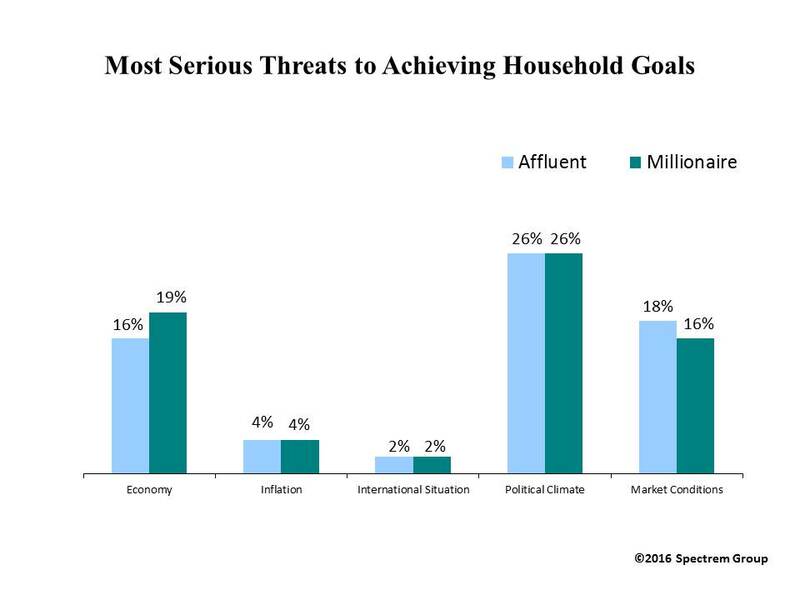 The 26 percent of Affluent investors who consider the political climate to be the most serious threat to achieving their household’s current financial goals is a gain of 11 percent since June 2016 when this question was last asked, and the highest response to this question since September 2010. That was the year of the midterm elections, in which the Tea Party was a rising force and the Republican party recaptured the majority in the U.S. House of Representatives with a gain of 63 seats, the largest seat change since 1948. This survey was fielded between Sept. 16-21. Last month was a particularly volatile one in this increasingly tight presidential race in which both candidates suffer historically low favorable ratings among the electorate. Clinton’s health issues became a trending news story when it was revealed she had been diagnosed with pneumonia, which her campaign did not disclose. On Sept. 16, two black men in different cities, Tulsa, Oklahoma and Charlotte, North Carolina, were shot by police officers. The incidents renewed focus on race relations and law enforcement, pivotal issues in this presidential race.